Coinciding with Fall Equinox (September 22), the Vintage Fashion Expo returns to the Concourse Exhibition Center for two days of fabulous vendors selling vintage clothing, baubles, and one of a kind items you couldn’t even imagine. Did I just die and go to Vintage Heaven? Yes, yes I did. Shopping for vintage and thrifted items is definitely not for the faint of heart. Most of my friends ask, “How can you stand that musty smell?” followed by “Um, I’ll just wait outside” are the usual responses I hear. Their comments fall on my deaf ears, as I’m already knee deep digging through bargain bins or flipping through racks of clothing. Fear not, for as long as you are armed with a bottle of hand sanitizer for post shopping clean up, thrift shopping can be quite fun and rewarding if you just put in a little elbow grease. Or, you can shop in a fancy vintage boutique where they have perfected the art of removing that odor. 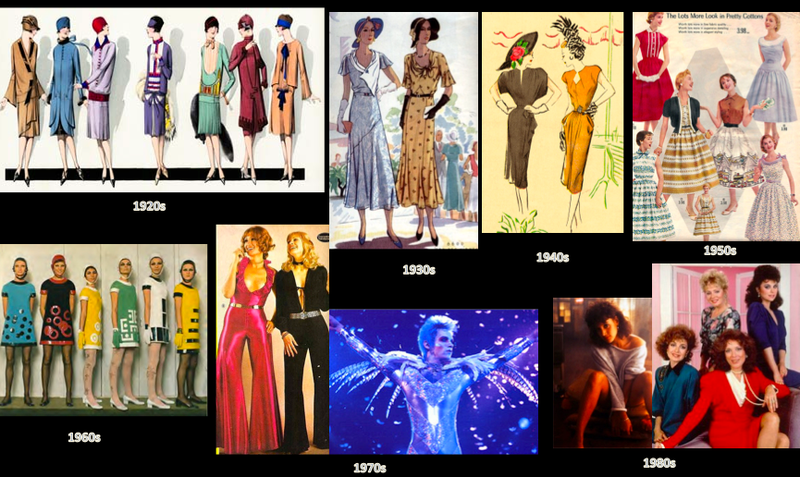 Some trends overlap in decades, and there are styles that I have left out to keep this brief. This list is not meant to be exhaustive, and I am exhausted after all my research! If there is a favorite fad of yours that I didn’t include, please share. i’m so proud of you =) I can’t wait to be in the same city again. Show us what you bought at the Vintage Fair! Just added my recap! Please see new post!